Christmas is now officially a time for app downloads and purchases. Latest research from app analytics company Distimo shows that the number of iOS app downloads rose by 53 percent and the amount of revenue increased by 56 percent during Christmas Day this year, compared to an average day in December. However, these figures are lower compared to previous years. Distimo notes that in 2011, there was a threefold growth in app downloads compared to an average day in December, and in 2012 the number of downloads almost doubled while revenue rose by 70 percent. Compared to last year, the rate of revenue increase this year during Christmas was larger than the growth rate for downloads. According to Distimo, Christmas made the most impact in the UK this year — with download volume up by 161 percent on Christmas Day. In the US, revenue almost doubled, tacking on 97 percent in the Apple App Store. However, large Asian app markets such as Japan and South Korea barely saw any rise in app downloads and revenue. Mobile firm Flurry also released its festive figures recently — which showed another “record-breaking level” of app downloads this Christmas, up by 91 percent compared to an average day in the first three weeks of December. 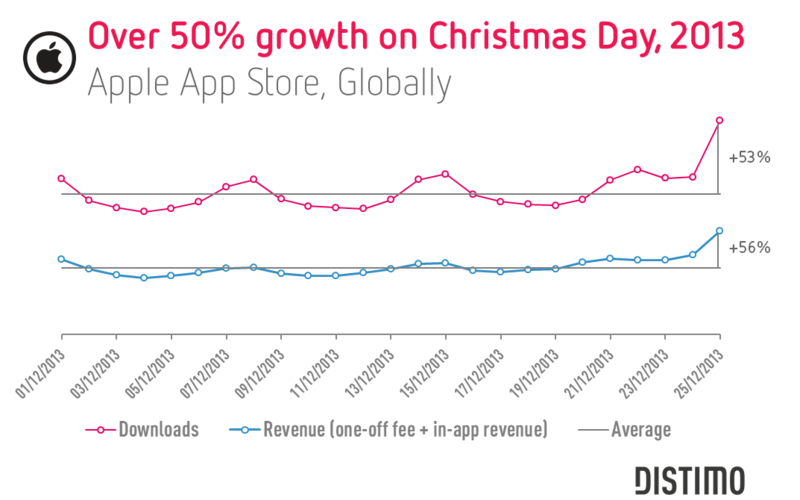 However, similar to Distimo, Flurry also notes that “the size of the Christmas download spike is diminishing over time as the app market matures and globalizes.” Flurry says that the slowing growth rates and smaller Christmas Day app download spike come as many Western consumers — in markets where Christmas is a big holiday — already have a mobile device, which means fewer people are coming online via mobile for the very first time. Instead, Flurry notes that as growth in mobile increasingly comes from China, where Christmas is barely celebrated, new device activations and app downloads are being spread out to different times of the year.